We will become foster parents within the next month, and with that comes getting the space ready for our little "beloved babies" that we will be caring for. I showed some progress not too long ago, today, I'm bringing home a guest post that originally appeared at A Jennuine Life for Jenn's Lost Art Series. 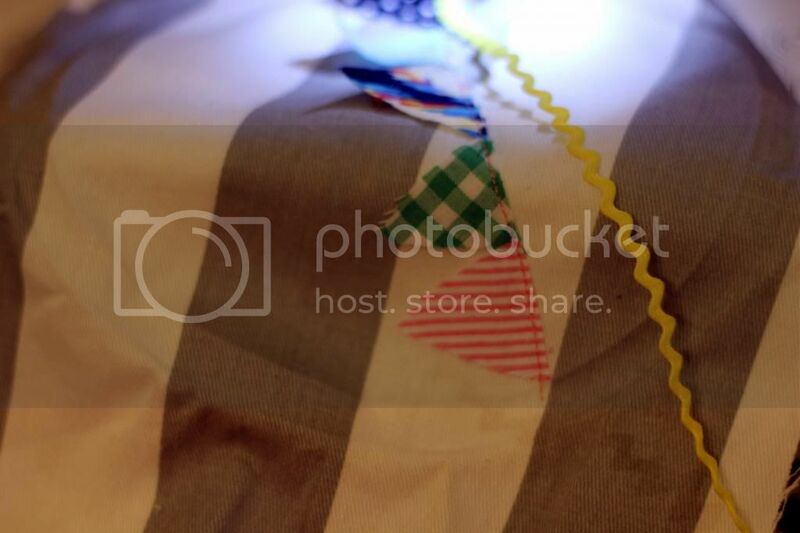 I hope you enjoy taking a peak into "Beloved's room" with this little project. Hi! 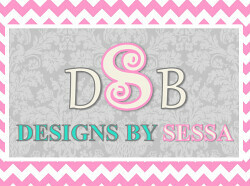 I'm Vanessa and I blog at Designs By Sessa, my slice of blog "heaven" where I write about my love for Jesus and sewing! When Jen asked me to join in the fun of the Lost Art Series, I drew a complete blank! Okay, haha, this is me this past Halloween, when Party City sent me an I Love Lucy costume to review... it makes me laugh and totally represents how I felt at first thought of this project... haha! To be honest, I love sweet details of the good old days and love mixing vintage items with new, using antique hand sewn quilts with modern details, and I will be the first to throw a (machine) monogram on a pillow case or hand towel, but when it comes to MY OWN sewing I tend to do whatever I can on my machines. 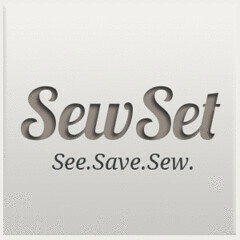 I am SO thankful for modern technology and machine sewing! While hand sewing techniques are truly amazing to me, I do not know how to (yet) smock; and hand embroidery (which I have tried in a few of my projects) usually ends up rather imperfect and not quite what I was going for. 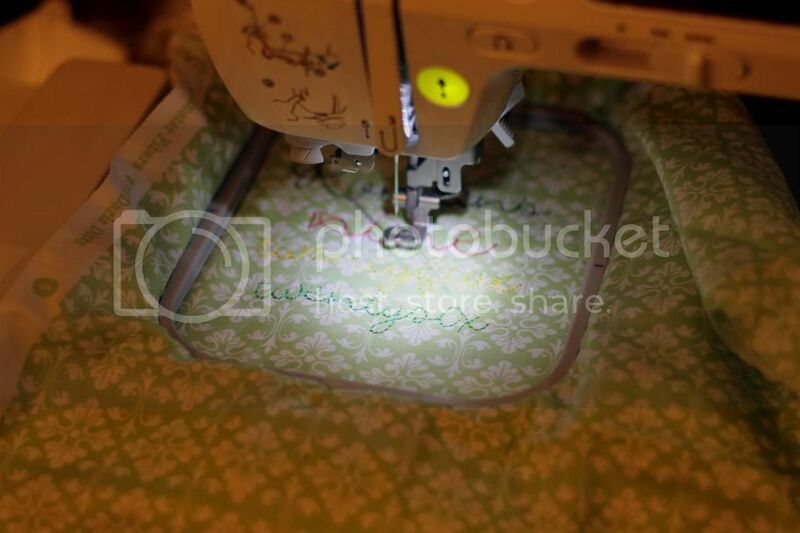 Then, add to the equation that I have a sewing machine that also does machine embroidery and I don't quite care to stitch things out by hand when I can design them through software and program my machine to do them! 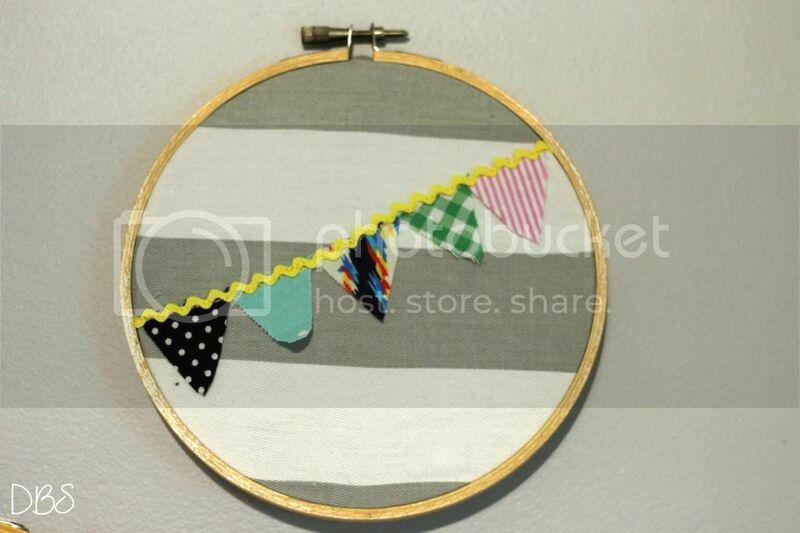 To be honest, I don't think any of our sewing is truly lost, it's just constantly being reinvented and updated and made new, the same old stuff. Here are some of my hand embroidery projects I have attempted. I do love how they add a sweet personal touch, despite their imperfections! 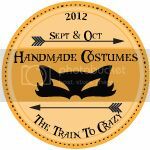 In this post, I have a slight twist maybe cheating in that I'm using modern sewing practices, but making them look "old" like a "lost art". 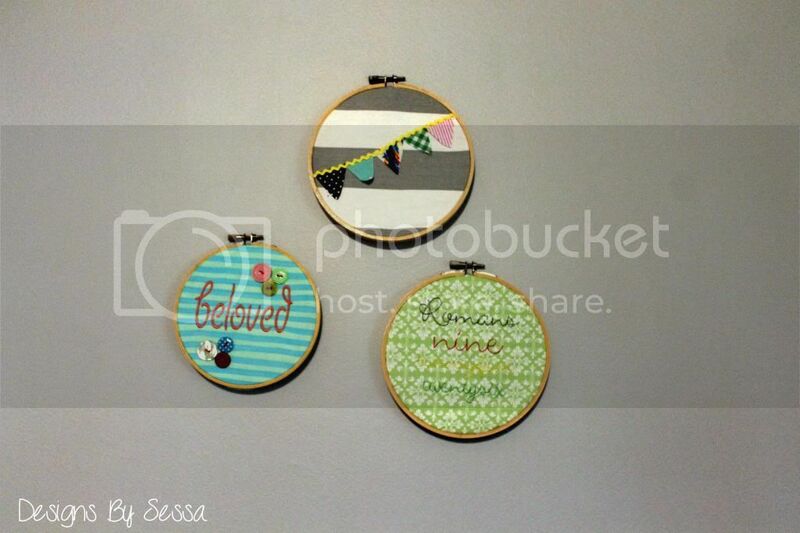 To accomplish this goal, I have created some fun Embroidered Hoop Art for our nursery. 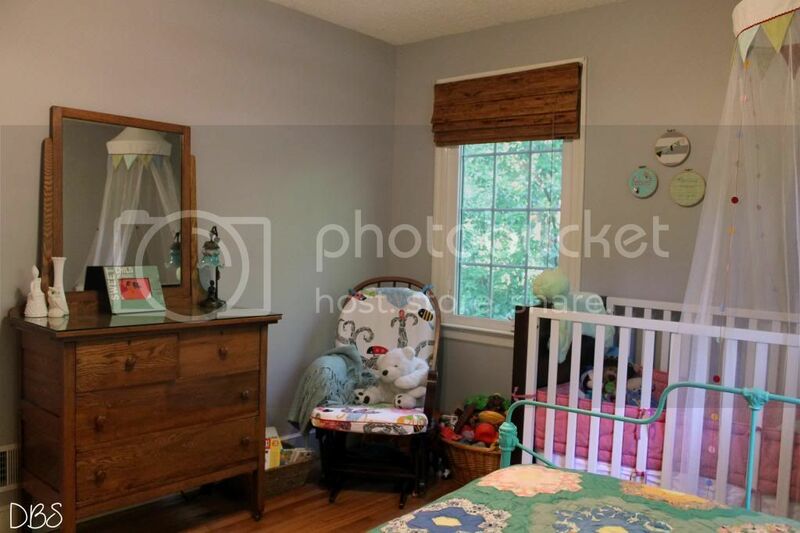 We are currently becoming foster parents/wanting to adopt and I have been working on small projects in this room to get it ready for when we are approved in another month or so! 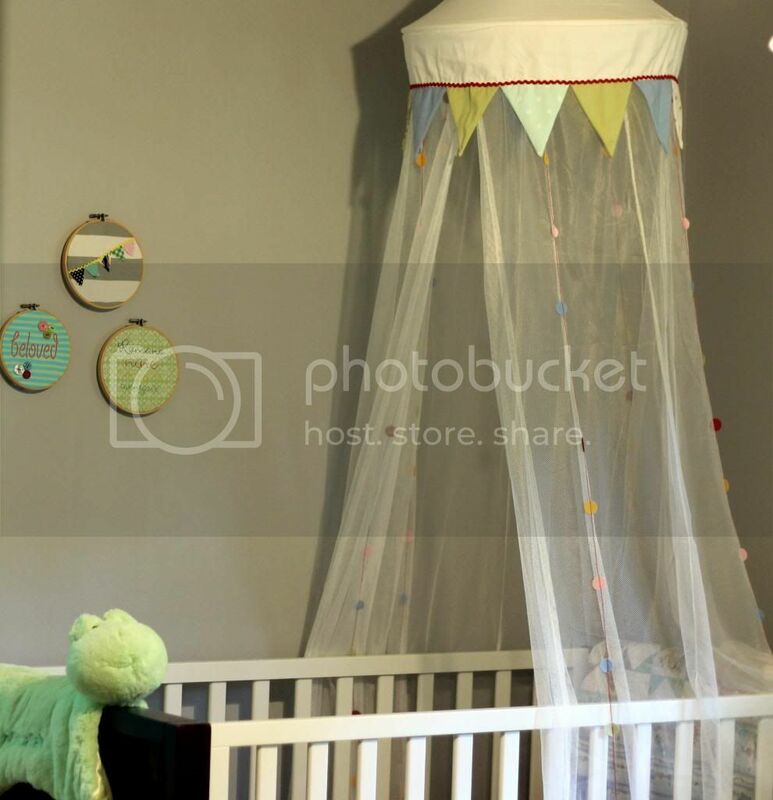 I thought our crib needed a little something extra above it. So, I "cheated" and did some machine embroidery and then framed them with old hand embroidery frames! I know, I know... what you are thinking, but bear with me, because there was a lot of love and thought and time in these! Let's take the first hoop. 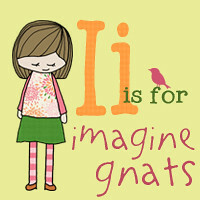 I designed a font in software to look like it was hand stitched out by me, but it was done by machine! Re-invented, right!? I repeated this same process, doing the embroidery by machine after designing it in software, but for this next one, I hand sewed on a mix of modern and vintage buttons with embroidery floss (by hand). 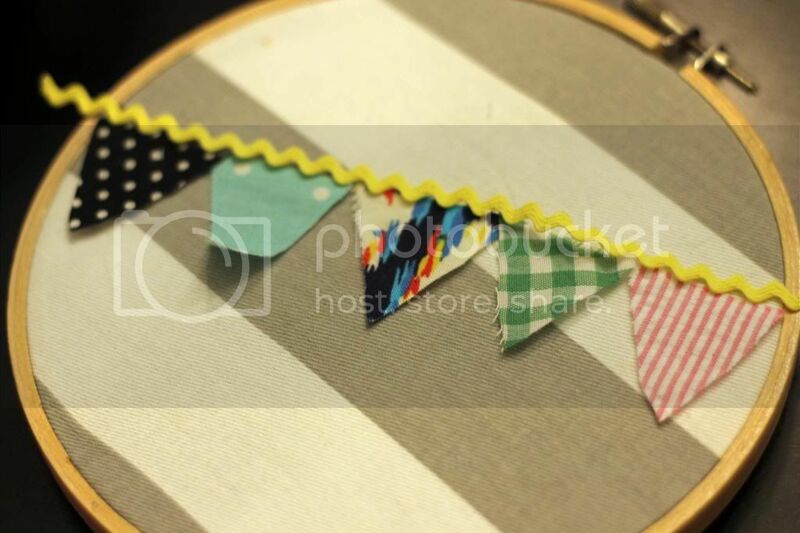 Lastly, I cut out 5 similarly sized triangles to create mini-bunting in the hoop. I stitched these across by machine and then added some ric rac across the top, framed it as well. 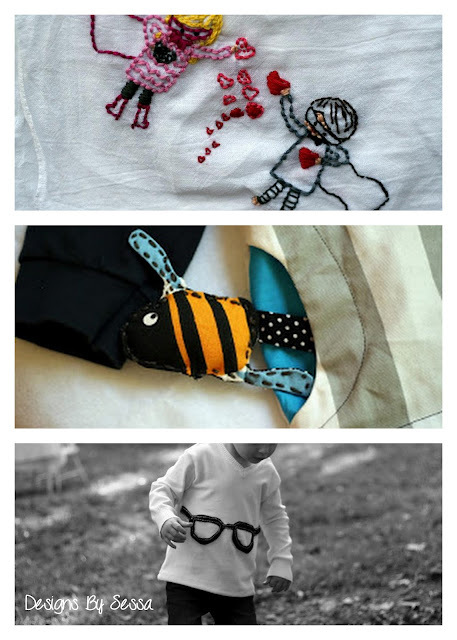 I think another value that hand-made items give is that each has a sentimental factor. 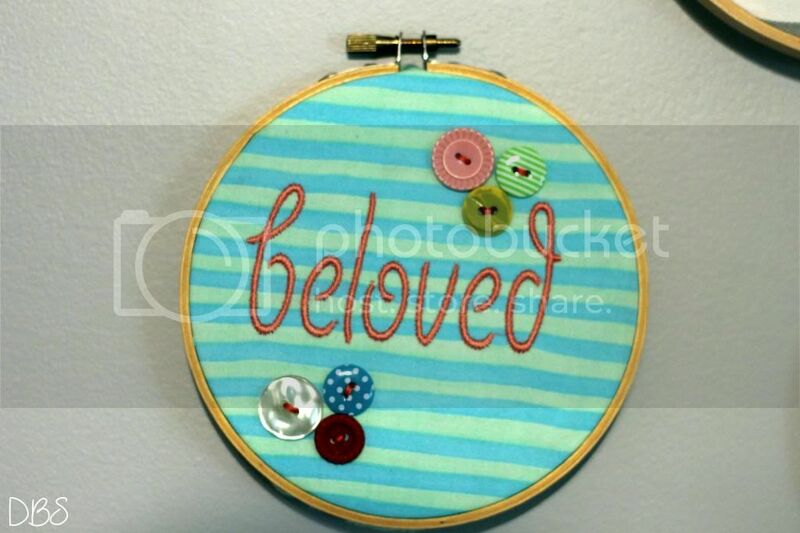 So, while done some by hand and some by machine, the thought behind this hoop art is high. 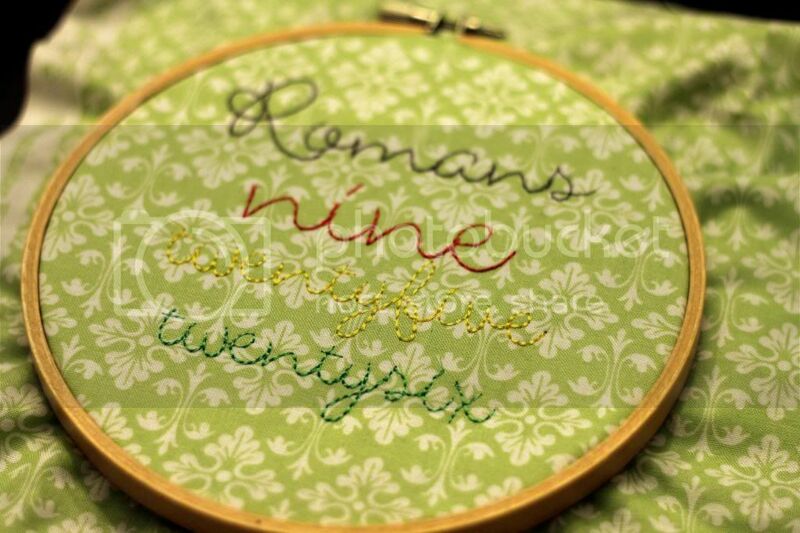 You may have noticed that one hoop says 'Romans Nine Twenty-Five Twenty six' and one says 'beloved'. In Romans 9:25 - 26, it says "Those who were not my people I will call 'my people,' and her who was not beloved I will call 'beloved." And in the very place where it was said to them, 'You are not my people there they will be called sons of the living God." Awhile back, I felt like these were our adopted babies' verses given to me for my heart to encourage me, and that whatever child or children we have in our home would be my 'beloved'. The power of adoption is strong and I feel so blessed to be adopted into God's kingdom through Jesus' love for me. A love that covers a multitude of sin. 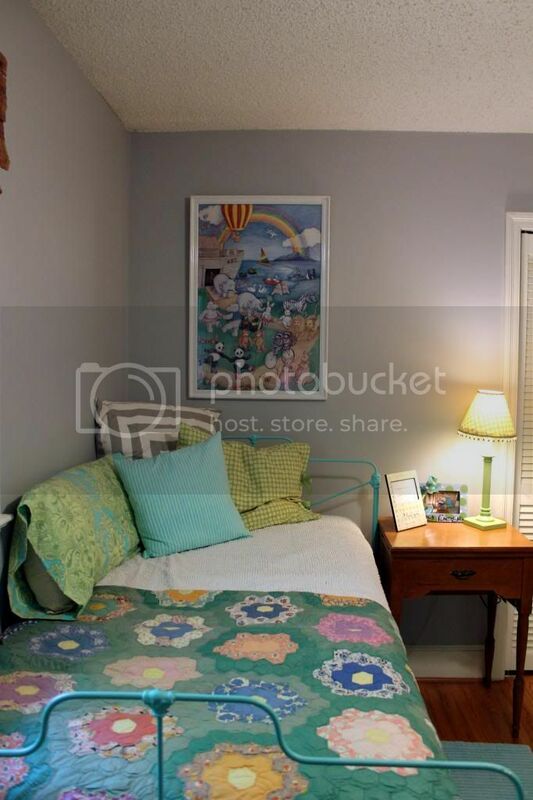 And just so you can see another angle of this room, I actually have an antique sewn-by-hand quilt on a semi-vintage 70's chenille cover, and a slew of pillows made by me. Jen, thanks for having me! 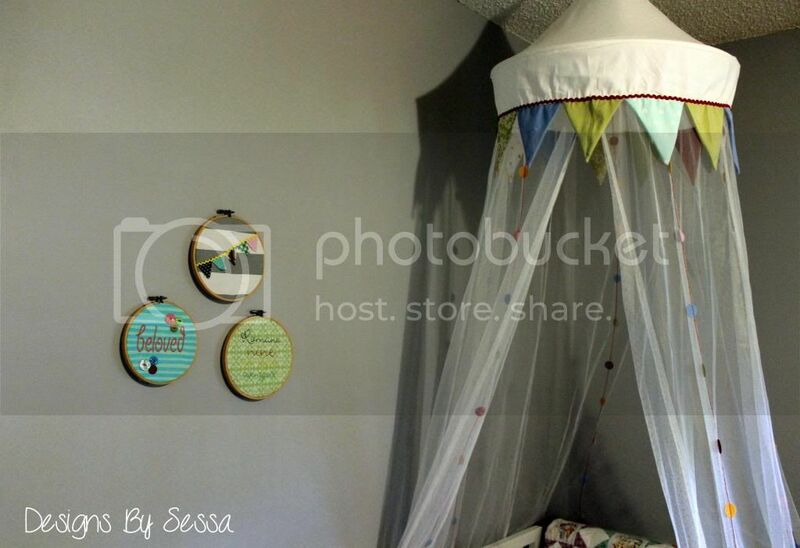 And please come check out Designs By Sessa sometime! You can follow our adoption story and see what God has in store for us ahead, as well as, quite a handful of sewing projects!